Wireframes are basic layouts that detail a page’s goals, navigation, and structural elements. They’re meant to make you focus on the foundations of a page before moving on to design choices. It’s a common mistake to try to incorporate design into wireframes, but when you do this, you make it difficult for viewers to assess your layouts objectively. Something that impresses the viewer visually might not actually do the best job at executing the goals of the page. Visuals and wireframes should never overlap. Going into too much detail too quickly in the process creates problems for all involved. Wireframes are designed to convey information, not style. Colors, fonts, and other visual choices aren’t needed at this juncture. Instead, keep your intention set on creating a guide for design to follow. What information is most important to present first? How will users navigate between areas? What kind of story does your page tell? Do areas of the page create questions or concerns for the user? Is it clear what the user is supposed to do on a page? Is it easy for users to find sections they need? With wireframes, the goal is to create a seamless user experience that guides users towards informed, appropriate decisions. At this stage, we’re assessing how well each page matches user needs with business goals. Choosing minimalist representations for your layouts help all viewers focus on these questions. Adding design isn’t just unnecessary work; it’s actually a distraction. The brand always matters. However, it takes a back seat to functionality at this stage. The only occasions where you might consider certain branding points is if a particular brand has a highly stylized and specific user experience. For most, the closest you should come to branding in a wireframe is your content. Working with real content is always a plus when wireframing, even if it’s just a first draft. Even if you already have some of the images that will eventually use, don’t place them on the page. Convey that you plan to use that image with a notation like you would with any other element. Rushing the creative process does no benefit to your end product. Keep the process moving at a deliberate, steady pace. Branding will soon become a huge component. Right now, it doesn’t need to be your team’s concern. If your wireframe goes beyond two tones, consider reducing your palette. Color, like visuals, create distractions, and will rarely, if ever, need to come into your design. That means excluding even the slightest of gradations. 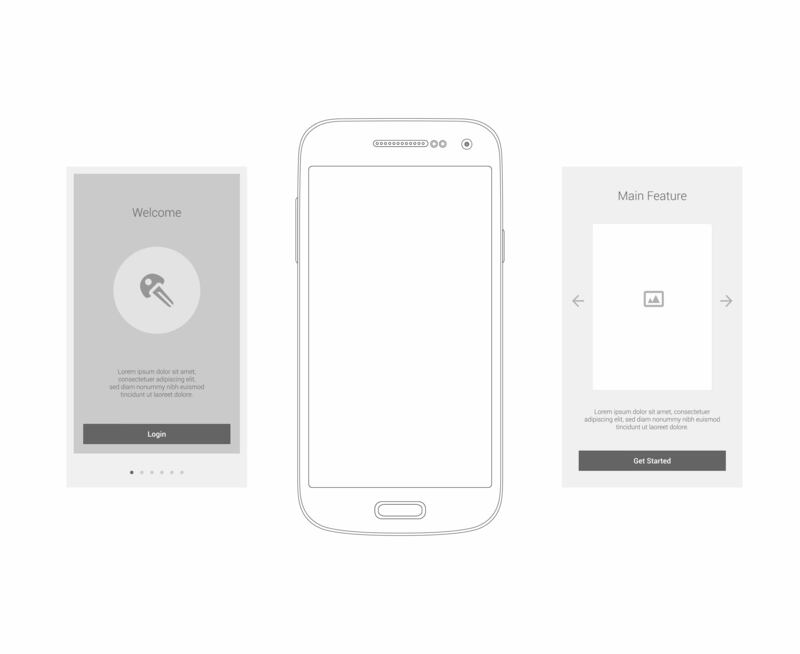 Monochrome is your best option in 99.99% of all wireframing. It keeps everyone’s focus on the goals of the page. If you’re worried it looks plain and technical, excellent; you’re doing it right. Colors shift your perspective. Some components become more emphasized by a splash of red. Meanwhile, a key conversion point easily gets overlooked. Nothing should stand out visually, so everything can stand out structurally. At some point, a full-color design will be needed. However, it should come after your structure is firmly in place. There’s no use in designing something that fails to support itself structurally. Creating a visually detailed wireframe is alluring, especially if you’re creative. More details allow you to flesh out in-depth ideas you have for the project. They also help bring the user experience to life for the viewer. And in some cases, a project does indeed call for them, but never as a first step. Unfortunately, introducing visuals too soon in your workflow will end up causing more harm than good. Rather than focusing on creating a page that functions properly and meets its goals, people end up debating and revising elements that never even make it into the final design. Give your team too much to consider at once, and different iterations of your original design will quickly get out of hand and over budget. Focus on one layer of the project at a time. Don’t waste energy and time fully designing a wireframe when simple shapes and a monochromatic color scale actually do a better job at communicating your intent. Emphasize site copy over UX. In doing so, you do what’s best for the project and yourself. Your team won’t stress over designing elements that get nixed. Meanwhile, you can focus on building a highly functional page before design steps in to make it beautiful. Non-detailed wireframes: a win-win idea. Searching for the right diagramming tool? Check out Cacoo, a cloud-based diagramming tool for team collaboration. Cacoo Cacoo is your friendly, neighborhood diagramming app. Since 2009, Cacoo has been helping individuals and teams visualize their ideas with ease. Today, over 2 million users around the world depend on Cacoo to bring their ideas to life.